While there are several distinct types of condensation in buildings, surface condensation is by far the most common; indeed it is the most common form of dampness within domestic properties. Unfortunately, it is often misdiagnosed as other forms of dampness. So how is surface condensation is formed? Warm air can hold more water vapour than cold air – the warmer the air the more water it can hold and conversely the cooler the air the less it can hold. Thus, given this fact, it becomes evident that if warm moisture-laden air is cooled there will come a point at which the air is cooled to such a level it can no longer hold the moisture present. It is at this point the excess moisture starts to change from its vapour state to a liquid and effectively drops out of the air – this is what we see as condensation. In practice the effect is seen when moisture-laden air comes into contact with the cold surface, the coldness cools the air to an extent where it can no longer hold the excess water and it therefore falls out as liquid water (condensate) on the cold surface. 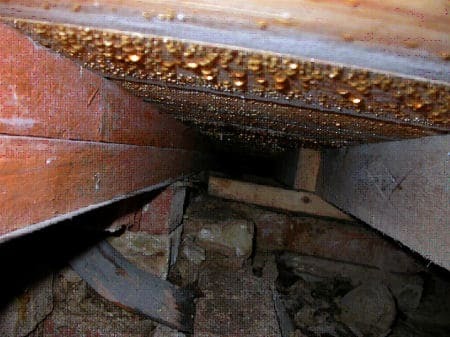 The visible signs of surface condensation are usually the formation of liquid water on impervious surfaces such as glass, oil paint, tiles, vinyl wallpaper, etc; these can lead to water ‘run’ marks, rust runs (water passing over metal) and where particularly severe it can and does lead to rot, this being especially significant where long-term condensation forms beneath timber suspended floors. 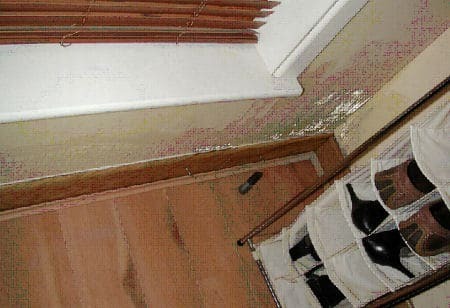 In extreme cases water condensing at the base of walls can also decay timber skirtings; this usually causes a wet rot. On more permeable surfaces liquid water is initially absorbed, only becoming visible as dampness if the condensation is long term and severe. 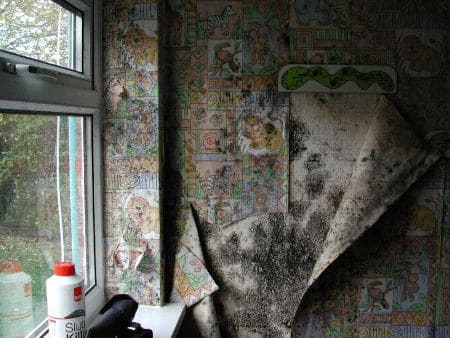 However, perhaps the most common feature of condensation is mould growth: this is usually seen as ‘black spot’ mould but green, yellow and white moulds may also develop depending on the conditions and the particular surface. There are proven health hazards associated with moulds, the most common being a trigger factor for asthma. However, it appears likely that in most healthy people only heavy, persistent moulds may potentially cause a problem although some people may be particularly sensitive. Nevertheless, prudence is dictated wherever moulds are to be found in occupied domestic buildings. When mould growth is active the moulds emit volatile compounds which caused the distinctly ‘musty’ odours associated with dampness. This can be very important in that it is not uncommon to get such a musty smell yet there is no visible evidence of mould growth on walls. Why? 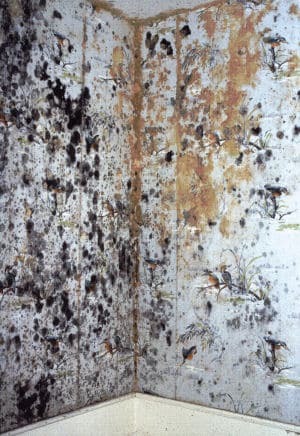 Mould will grow on water sensitive materials without actual condensation occurring. This happens where the air may remain over around 75% saturated with water vapour where moulds can then develop on such materials like leather and certain cloth. What grows where depends on the numerous factors the most significant being the particular saturation moisture content of the air (relative humidity). Where does the excess atmospheric water vapour come from? It is inevitably derived from normal living activities such as washing, cooking, bathing; indeed, just being in a building produces moisture from breathing and sweating. An individual in occupation can produce up to 10 litres of water simply from normal ‘life-style’ activities. However, contrary to most people’s beliefs the excess water is not derived from damp walls or floors unless extremely severe such as flooding; these sources are very limited compared to moisture generated from normal ‘lifestyle’ activities and only contribute a very small proportion of water to internal moisture production. Normally such moisture is vented away but in some cases it is not – double glazing, draught exclusion, blocking of air vents and chimneys (if present) all restrict the venting of moisture laden air, especially from those areas where most water is produced such as bathrooms and kitchens. Where this occurs it inevitably leads to problems as described above. One should also consider that condensation will occur in the non-living areas such as sub-floor voids and roof spaces; in these areas it often remains unnoticed and can lead to timber decay if sufficiently long term and severe. At Timberwise we can correctly diagnose different causes of dampness. Indeed, it is imperative that diagnoses are correct – a misdiagnosis especially in relation to condensation and high humidities can lead to unnecessary expense and continued dampness and deterioration. We at Timberwise can offer specialist, specific advice and supply complete solutions as to the control and elimination of condensation and persistent problems of high humidities and associated mould growth, thereby reducing the potential health hazards associated with such growth in domestic properties and with our recommendations a healthy living environment may be achieved. I have a 25′ x 12′ wooden shed that has celotex insulation sandwiched betwen the mdf walls and floor, with a felt roof on top. In Summer on hot days a tremendous amount of condensation drips from the ceiling, but not the walls. There is very liitle air space between the celotex and the mdf below it and the plywood above it. I have installed about 50 small plastic vents into the mdf ceiling but this has not helped at all. The condensation is only a problem in the Summer, not the Winter, is it something to do with the celotex (and the metal foil attached to it) reacting with the shed roof felt. Would a dehumidifier solve the problem? Can I have a survey?